More than five years after Jim first made a deal with illustrator Brian Froud to develop a fantasy film together, their vision finally hit the big screen. After completing the score and sound recording during the first months of 1982, Jim began testing The Dark Crystal on audiences and continued editing and reworking the film. By that fall, focus shifted to promotional activities and production of the behind the scenes documentary. Finally, on December 13, 1982, Jim was ready to premiere his film to an invited audience at the Loews Astor Plaza Theatre in New York. The screening was followed by a party around the corner at the RCA studio. It was a busy week. After Jim’s backer Lord Lew Grade sold his shares of Associated Communications Corporation (ACC) and left the company in early 1982, Jim began negotiations to buy out the rights to The Dark Crystal. The deal was completed just in time for the film’s theatrical opening on December 17th. Leading up to the opening, the industry paid close attention to the film, and its design and technology were featured in numerous publications. But when reviewers went in to the theaters, they didn’t really know what to expect. 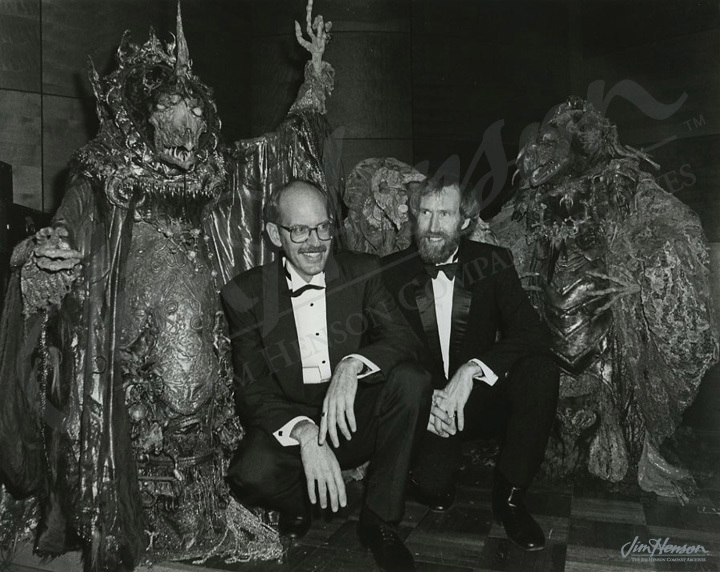 All the reviews marveled at the artistry and effects and praised Jim and his co-director Frank Oz for the astonishing creatures and settings – they just weren’t sure what to make of a Henson film without Kermit the Frog. 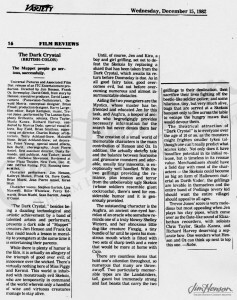 They praised the ambitions of the film but ultimately, they weren’t satisfied with the story – it would take time for The Dark Crystal to find a following. More than thirty years later, its genius is recognized, and it is a cherished classic among fans of fantasy, puppetry, and Jim Henson. 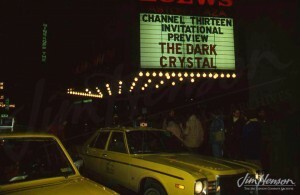 The ticket to the private premiere screening and party for The Dark Crystal. The Loews Astor Plaza Theater marquee on December 13, 1982. 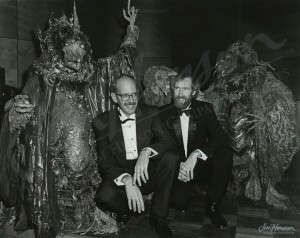 Jim Henson and Frank Oz dressed up for The Dark Crystal NY premiere party. 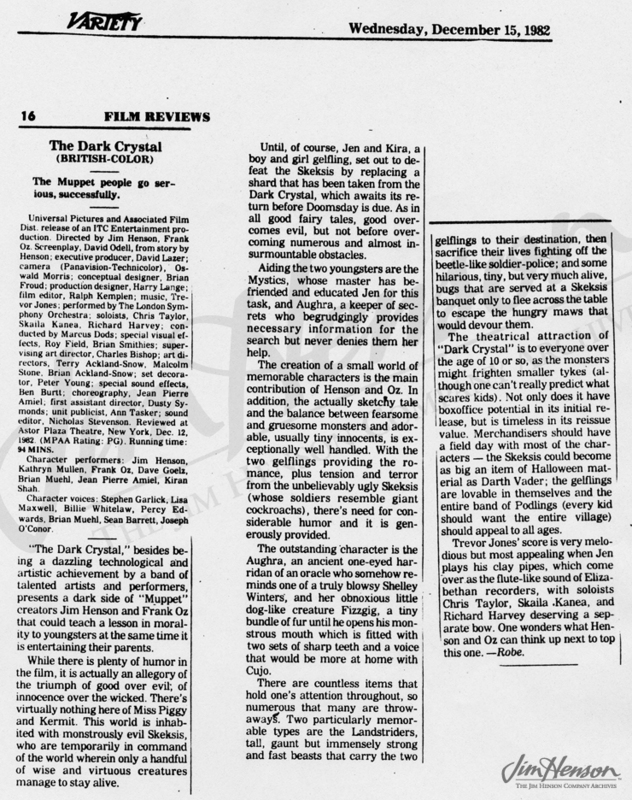 The Dark Crystal review from Variety, December 15, 1982. This entry was posted in 12-December '82, 1982, Dark Crystal, Social and tagged Froud, grade, lew, New York, Oz. Bookmark the permalink.